I have this fascination for city centers that were once old and dilapidated, and then restored and made of new. It's as if city developers searched an attic and discovered a dusty old jewelry box; decided to clean it up, and then opened it to discover a virtual treasure trove of goodies inside. Such is the case for the community that I visited for this photo shoot. Once ruled as a dreaded part of town, it is now a delicious hodgepodge of quaint vintage shops, rare book dealers, art galleries and eateries. Buildings are being restored to their former glory to reveal lovely architecture...some receiving a face lift by having a lovely mural painted on its facade. What was once deteriorating is, once again, welcoming and beautiful. One thing I have discovered about these quaint, restored towns is that I can usually find a treasure in one of their tucked-away little shops. Whether I'm shopping for a great vintage fine, a quirky new accessory, a book that was put out of circulation...9 times out of 10, my shopping adventure is a success. 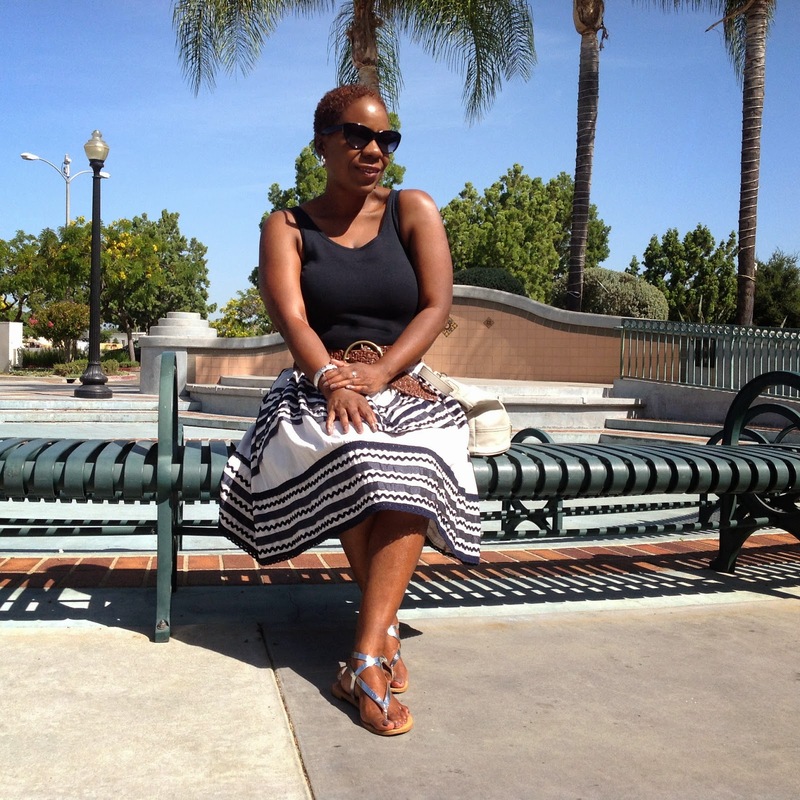 Today's look is a hodgepodge of pieces that I threw together for this post. For some strange reason, I think it works. As you'll see, each piece was purchased from a different location - some mainstream stores, while others were completely unexpected. Enjoy! 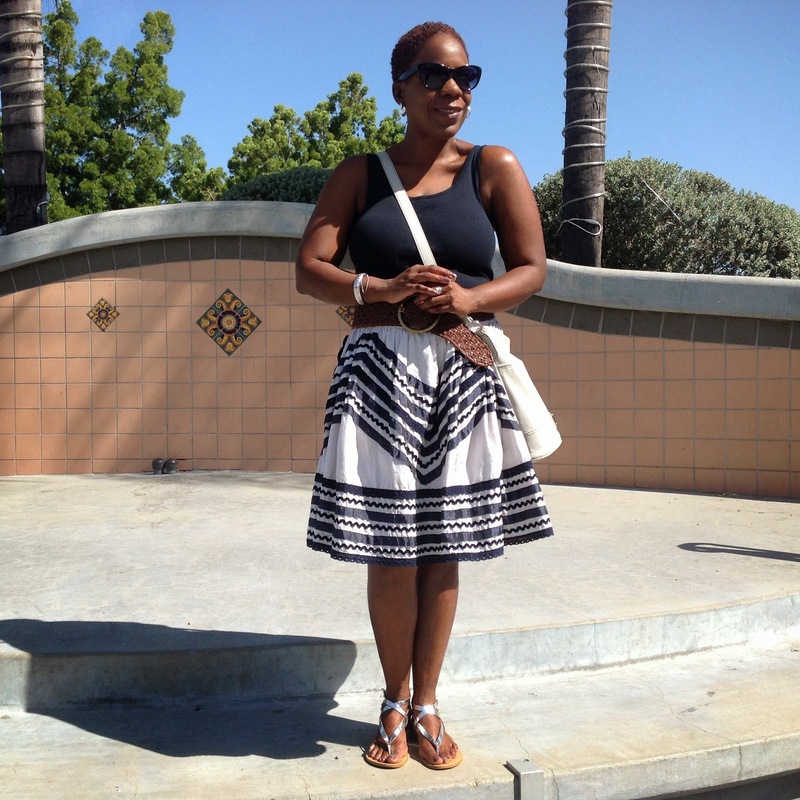 Today's Look - Skirt: Anthropologie (old), Navy Tank Top: Loft, Bag is Nine West via Marshalls, Sandals: Zara (old), Belt: Thrift shop in Palm Desert, Cat-eye Sunnies from the gift shop at the Getty Center Museum, Silver Bangle purchased from a vintage shop in another Southern California quaint community, Polish is Normani by Zoya. 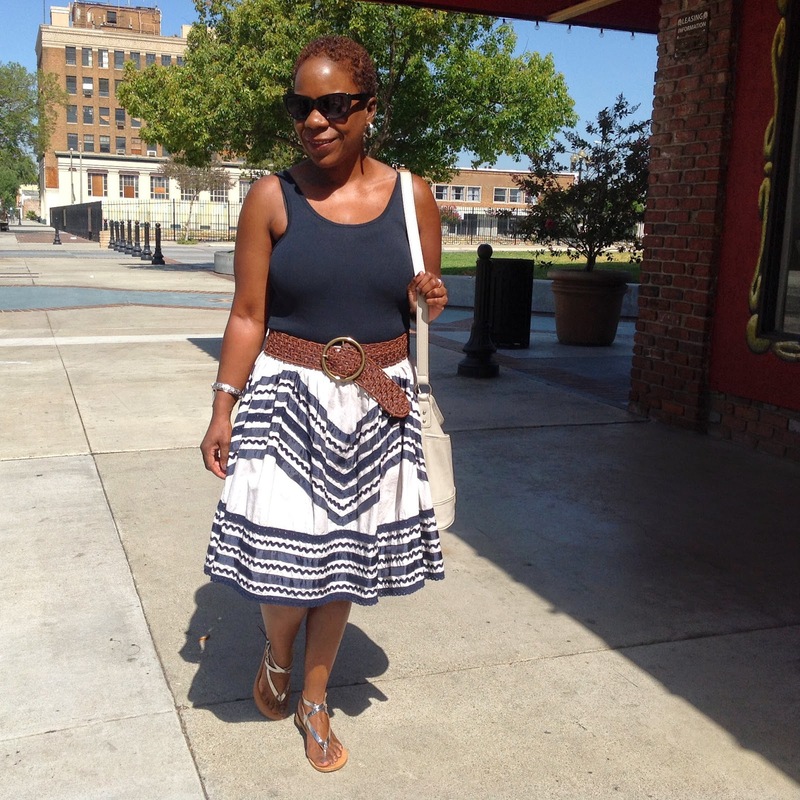 I selected this skirt for this post because it reminds me of a skirt that a woman may have purchased some time ago and had it in her donate bag. But then, she rummaged through her trusted box of crafting hodgepodge and discovered spools of blue ribbon. She decided to give the skirt new life by decorating it with the ribbon. Notice the boarded building behind me. I can't wait to see what developers will make of it. Oh yes, thank you to all the smart and insightful comments on Friday's post called Are You Shackled? (discussing age and fashion). It was fantastic! I love this combination. The way the shape of the sandals follow the shape of the ribbons on the skirt, brillant. Love how you thought of putting a brown belt on it (I can never come up with these things... so irritating). Great look. Thank you Greetje! My husband suggested the brown belt. I'm proud of him. I purchased the sandals last year on clearance from Zara and I discovered that the compliment so many things. A great find they were indeed! Wonderful, you also have a husband with a stylish eye. This is a great combo and you look very good and I love the sunnies. Enjoy! This outfit looks great-fresh and feminine. 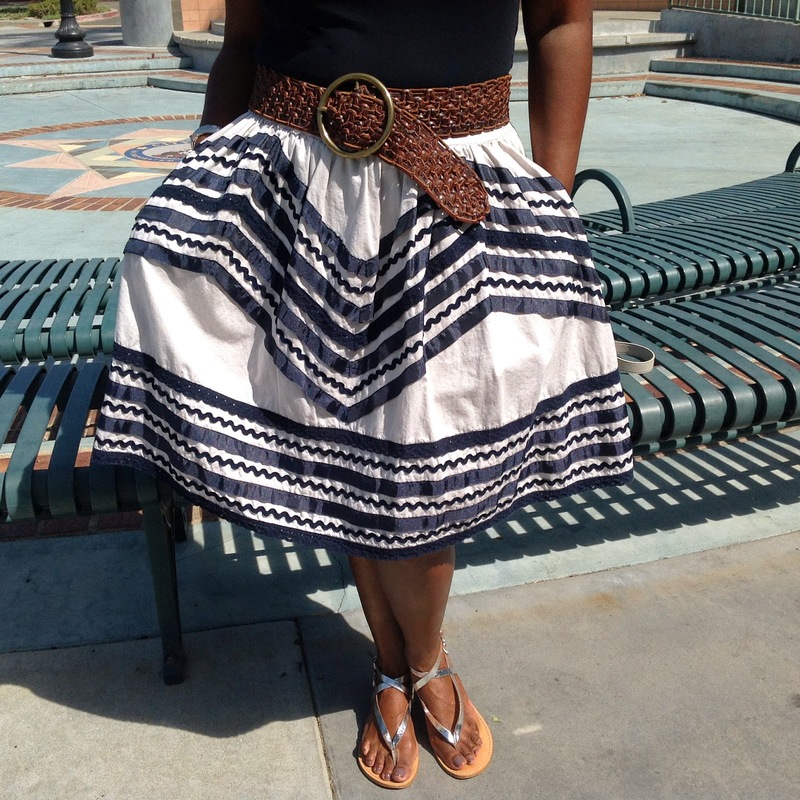 I love the ribbons on the skirt and the way the sandals echo them. I love that belt too and the big round buckle! There is just something about Rick rack that makes me happy. This is a terrific skirt. Lovely. Thank you Connie! Yep, searching for treasures is great fun. I have often found the most beautiful treasures as I wanted to buy anything. There were many pieces that were much nicer than in my imagination when I was shopping. I LOVE LOVE LOVE your skirt! For this kind of skirts I can die for. A few years ago I only had pencil skirts because I thought this wide midi skirts would not look good on me.. but now I found out hat wonderful the can look. Thank you Dana! I am the complete opposite...All of my skirts have flare. I just recently purchased a pencil skirt. I love your skirt, it's really cut and looks super comfy. Glenda you look gorgeous as always. Love the outfit. Classy chic and so so Glenda_ish. Thank you Lenya. I hope your week is going great! Yes, they are fun to wear. Thank you! 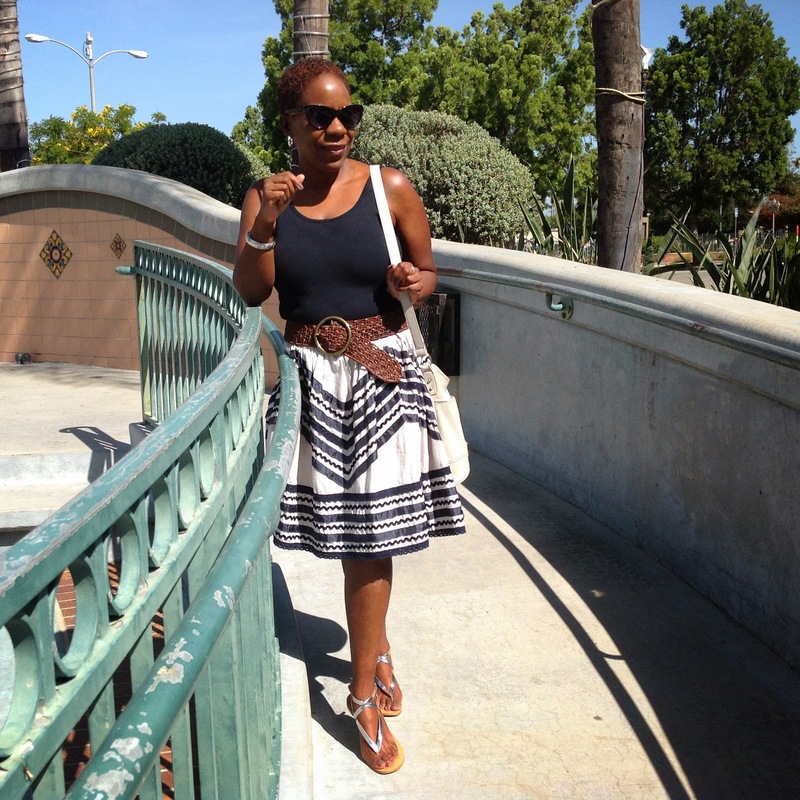 I love the mix in this outfit, perfect for Cali summers! Yes it is Cara, and thank you! Really cute outfit. Love the skirt. Blessings to you always, Jeannette. Jeannette, welcome to So What to Twenty! Thank you for such kind words. Such a lovely way to begin the day. I am touched to know that I inspire you and many others. Fashion has always been fun and exciting for me, so I'm glad that it translates to others. I'll stop by your blog. Thank you for the introduction! Oh yes - love love love those little rediscovered towns! I am a big fan of American small towns and villages in general, and those forgotten and rebuilt ones are such treasures! Wonderful trip and thank you for sharing, Glenda! Oh yes, the little American small town is such a treasure. It's too bad that so many simply pass them by on their way to the big city. It makes me sad when I see a small business close it's doors from lack of business. I really had fun wearing this outfit Natalia. 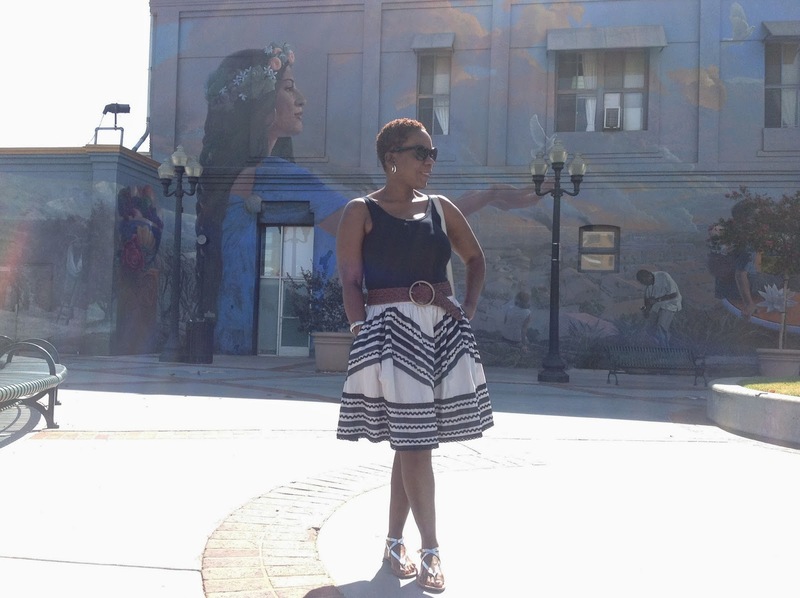 The skirt is such a conversation piece. I can't wait to see you in the kaftan! The same happened to the very center of Turin ( Italy ) which is now one of the most elegant places of the town! You look great in your summery, fresh outfit! I love your black and white skirt, and the sandals are wonderful! Thank you Dan. Actually, the skirt is taupe and navy. Loft living seems to be the style home of choice in out restored city centers.